A native of Vancouver, B.C., Liz’s art training began at Heatherly’s School of Fine Art in London, England and continued on at the University of British Columbia. A dedicated conservationist, she was B.C. Wildlife Artist of the Year in 1993 and 1995, Ducks Unlimited national artist for 95, 96, 97, 98, 2007, 2008 and was Habitat Canada conservation stamp winner for 1998. 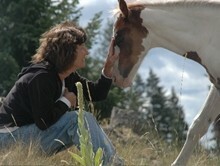 Liz has dedicated her life to understanding, communicating with, and helping animals. Through a long and illustrious art career, she has worked with conservation groups throughout the world, bringing awareness and financial support for areas and species in need of protection. Her art and her writing are strongly spiritual. Liz has managed to touch many with her vision and her work has been presented to dignitaries throughout the world. Over the last two years Liz has written four books, “One with the Herd: a Spiritual Journey”, “The Truth According to Horses”, a literary first that was conceived of and authored by her horses and “Life Unbridled: What Animals Have To Teach Us About Spiritual Freedom”, which she co-authored with her dogs, cats and horses and “Sabbatical: Resting In The Miraculous Power of Isness”. Liz’s first book “One With the Herd” won five Independent Publishing awards at Book Expo America in 2008.